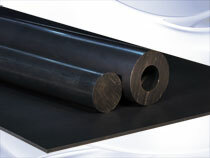 Molybdenum disulphide (MoS2) filled nylon offering improved strength and rigidity. With a lower coefficient of linear thermal expansion than Nylon 101, Nylatron GS parts maintain better fit and clearances, and have less tendency to seize as bearings. Nylons can absorb up to 7% (by weight) water under high humidity or submerged in water. This can result in dimensional changes up to 2% and a corresponding reduction of physical properties. Proper design techniques can frequently compensate for this factor.